This is a portrait sculpture of King Narasimha I, ruler of Odisha , formerly Orissa, and surrounding regions (1238-64). Here he is receiving spiritual council from his Vaishnava priest, probably the Brahmana Acharyaraja. The composition is hieratic, with the king represented smaller than his priest to reflect the relationship of pupil to teacher (achariya or guru). The priest is of high status. He wears fine rings and sits cross-legged as he expounds. The bearded king is simply dressed, stripped of all royal symbols. He is seated in a yogic posture, with his sword placed on the ground, holding a palm-leaf manuscript which is emblematic of divine knowledge. He is accompanied by two male figures (perhaps his sons?). In the register below four members of the royal guard wait, casually leaning on their shields, decorated with Vishnu’s conch. This scene of royal instruction is set against the backdrop of a temple. It is very probably the shrine of Purusottama-Jagannatha (Vishnu as the supreme god), the tutelary deity of the king’s household, at Puri. The Eastern Ganga dynasty closely identified their rulers with Vishnu. They adopted the title' Narasimha' after Vishnu’s 'man-lion' form and claimed descent from Vishnu himself, acting as his agent on earth. Under this system, even the king must defer to priestly intermediaries if he is to enjoy the benefits of divine power and favour. 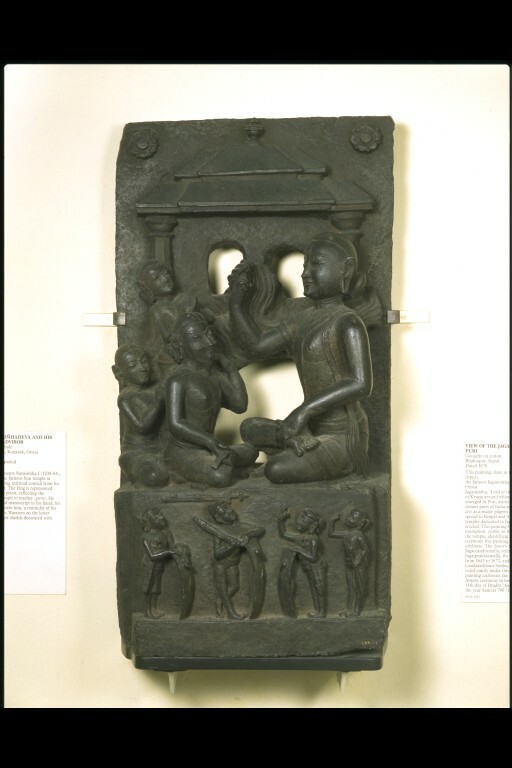 This relief is one of a series depicting aspects of royal Vaishnava worship in Odisha and is associated with the Sun Temple at Konarak. Narasimha I was the patron of this mighty temple dedicated to Surya, and this series originally decorated the temple’s walls. 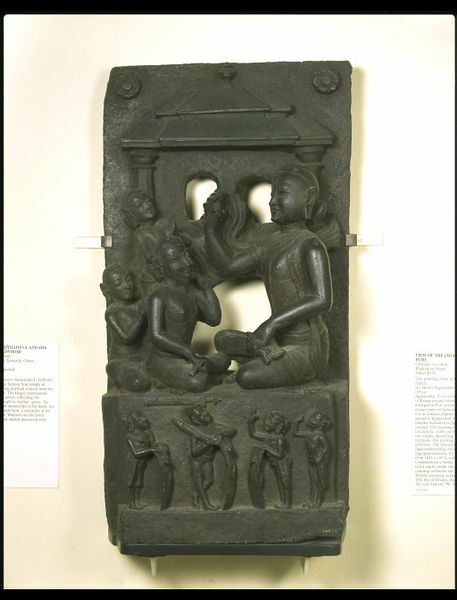 A source contemporary with this relief suggests that the artist was the eminent sculptor, Visvanatha Mahapatra. In this Konarak sculpture Narasimha is depicted with his guru, probably the yogi Acharyraja. As king, Narasimha, named after the 'man-lion' incarnation of the Hindu god Vishnu, ruled Odisha and neighbouring regions of eastern India from 1238 to 1264. He held political control over the region in which the Sun temple was constructed and was the actual patron of the temple, yet he is shown as smaller than his guru. The guru sits cross-legged, with one arm raised in a gesture of explanation. The bearded king, seated in the centre of the sculpture, is stripped of all royal symbols. His sword lies on the ground in front of him. Instead of a weapon he holds a palm-leaf manuscript, the original medium for transcribing sacred texts in India. Beside the king are two attendants: one sits reading a palm-leaf manuscript; the other stands with his hands joined together in a demonstration of reverance. On the lower register, on a smaller scale, four warriors stand with shields and weapons. The message is clear here at the temple even the king must defer to the status of priestly intermediaries if he is to partake of the benefits of divine power and favour. This scene represents Narasimha I (1238-64), the builder of the Sun Temple at Konarak, receiving spiritual council from his Vaishnavite priest. The king is represented smaller than his priest, reflecting the relationship of pupil to teacher (guru). He holds a palm-leaf manuscript in his hand, his sword resting beside him, a reminder of his temporal powers. Warriors on the lower register have their shields decorated with Vishnu's conch. E.B.Havell, Eleven plates representing works of Indian Sculpture, Chiefly in English collections, London, India Society, 1911, pl. III. O.M. Starza-Majewski, 'King Narasimha I before his Spiritual Preceptor', Journal of the Royal Asiatic Society, 1971, pp.134-8. Donaldson, T.E. Hindu Temple Art of Orissa, 3 vols, Leiden and New York, 1985-7, ISBN 9004071733, 9004071741, 9004071768, 9004071776, vol.II p.613, vol.III, pp.1170-1174 and fig.4218. Donaldson, T.E. 'Ganga Monarch and a Monumental Sun Temple' in Dehejia,V.(ed. ), Royal Patrons and Great Temple Art, Bombay, 1988, ISBN 8185026025, pp.125-143. Brand, M. The Vision of Kings, Art and Experience in India, Canberra, National Gallery of Australia, 1995, ISBN 0500974381, pp.8-11. 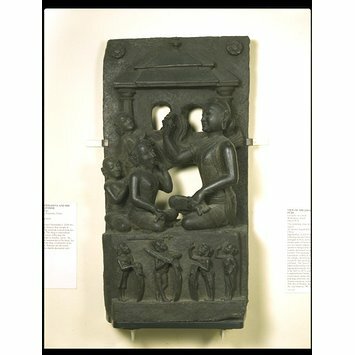 Guy, John: 'Indian Temple Sculpture', London V & A Publication, 2007, p.75. pl.84. Willis, M. (ed.). India: the Art of the Temple. Shanghai : Shanghai Museum, 2010. 254p, ill. ISBN 978-7-5479-0092-5. Cat. 2:30, pp. 164-5.
smaller than his teacher (guru). This scene represents Narasimha I (1238-64), the builder of the famous Sun Temple at Konarak, receiving spiritual council from his Vaisnavite priest. The king is represented smaller than his priest, reflecting the relationship of pupil to teacher (guru). He holds a palm-leaf manuscript in his hand, his sword resting beside him, a reminder of his temporal powers. Warriors on the lower register have their shields decorated with Visnu's conch.